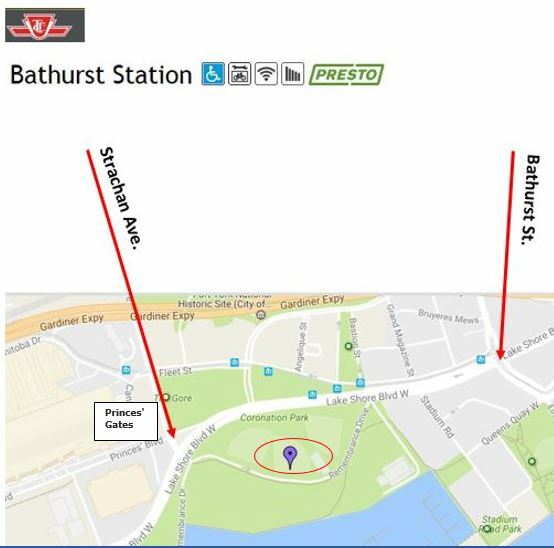 Take the 511 Bathurst or 509 Harbourfront Streetcar to the Exhibition Loop (Princes' Gates). Walk out to Strachan then south across Lake Shore Blvd and into the Park. Coronation Park can be found just east of Ontario Place along the Martin Goodman Trail. Coronation Park has three softball diamonds and a dog off-leash area. It is a beautiful spot to sit along the shoreline of Lake Ontario and enjoy a picnic on a warm summer day.